L. 1753 nae Thunb. 1784 nor Blanco 1845. 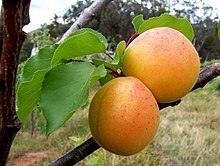 Prunus armeniaca ("Armenie ploum"), the maist commonly cultivatit apricot species, an aa cried ansu apricot, Siberian apricot, Tibetan apricot, is a species o Prunus, clessifee'd wi the ploum in the subgenus Prunus. The native range is somewhit uncerteen due tae its extensive prehistoric cultivation, tho awmaist certeenly somewhaur in Asie. It is extensively cultivatit in mony kintras an haes escaped intae the wild in mony places. ↑ 1.0 1.1 1.2 1.3 John H. Wiersema. "USDA Germplasm Resources Information Network (GRIN)". Ars-grin.gov. Retrieved 2012-06-22.